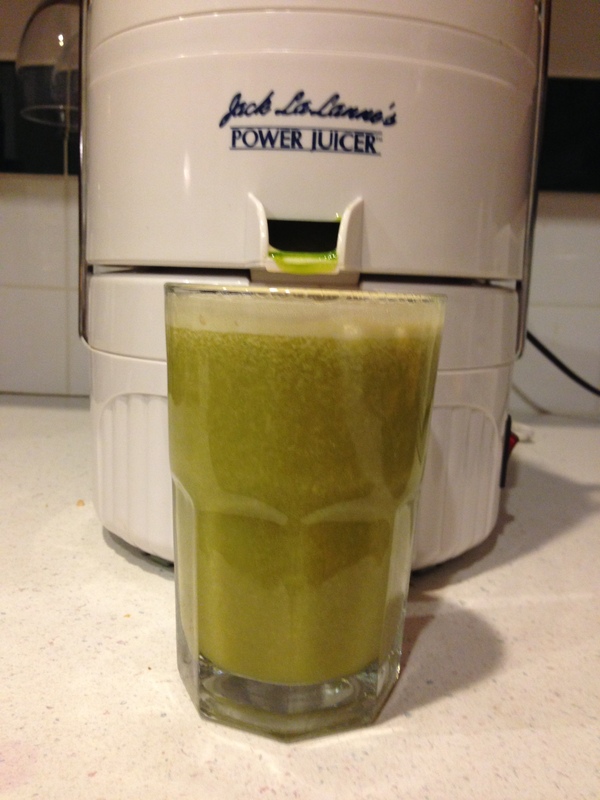 So this was the first time that I’ve used my juicer in at least two years….and that was before we were eating real food so I didn’t enjoy it (or use it) much. I knew I wanted to start using it again to further supplement my diet without actually taking a supplement in pill form. I didn’t actually have a plan of what I was going to juice so I just looked around the kitchen and used what needed to be consumed first. So we ended up with cantaloupe, apple and spinach juice. And it was super yummy! It’s the Jack LaLane Power Juicer and runs about $99 (you can click on the picture for the product details). There are many different types of juicers out there but this one definitely meets my needs. My only complaint about it is that it is kind of a pain to clean all the parts. But since it’s the one juicer I have used, I’m not sure how it compares to other juicers on the market. Cut the cantaloupe into manageable pieces that will fit into the juicer. Juice the cantaloupe. Add the apples (you may need to cut them in half so they will fit into the juicer). Add the spinach. Stir to combine juice in glass (don’t stir and it leaves interesting color separation). This made about 12 ounces of juice and was super delicious! It tasted like a perfectly ripe and sweet cantaloupe with a hint of apple but no trace of the spinach. Although it looks green, it definitely doesn’t taste green! This would be a good way to get your kids to drink their spinach and vitamins! Any other food combinations that you recommend or would like me to try out?